It can be fun choosing a name for the barber shop, but it is serious business too. Customers will deduce a lot from the business name and first impressions count, so be creative when selecting a name – but get it right. It is tempting to try to stamp an individual personality on the business name, but there are other issues to consider. When generating ideas about a name, the initial focus may be on personal preferences, but an objective approach will allow the customers to be the first consideration. Remember that the business name will be the cornerstone of the barber shop brand. It has to work well wherever it is used – be it in a logo, on the phone, sign, advertisements, stationery, website, uniforms or any other media used to reach the market. Being objective and choosing a name that reflects the barber shop’s strategy can be more valuable, especially as the business develops. Should the name reflect what the business does or is something more abstract suitable? Is it a good idea to include the owner’s own name in the name of the barbers? Is a traditional name for a barbers, conveying old-fashioned values and durability, more suitable than a modern name that suggests an innovative, fresh approach? Is the barbers name future-proof? Try to void words or phrases that may date quickly. Think about callers and customers looking for a barber and try to avoid long names with strange wordings or unusual spelling. 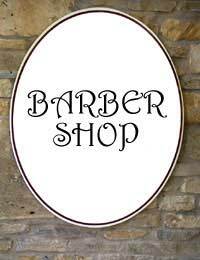 If planning to advertise the barbers in directories such as Yellow Pages, consider using a name that appears near the beginning of the alphabet and so will ensure an early entry. As a barber will focus on the local market to secure clients, think about including the name of the city or town in the business name. There are some words and expressions that cannot be used in a business name without official permission. These sensitive words might give a false impression about the business. For instance, British, Scottish or English may suggest the business is of national importance, while association, society or institute hint at a special status. Charity or trust suggest a particular function, while royal, queen or parliament suggest links with royalty or government and chemist or architect describe a specialised activity. If forming a limited company or limited liability partnership (LLP), the business name and other details will need to be registered with Companies House. The name must end with limited, plc or Ltd for companies, or limited liability partnership or LLP. It must not be offensive or contain any sensitive words and cannot be the same as or very similar to one already in the register. Those operating as sole traders or in general partnerships can trade under their own names or choose a different business name as long as it is not offensive and does not include any sensitive words or the words limited, plc, limited liability partnership, LLP or equivalent. Hi..im going to open a barber shop in London soon and i need a nice name please help thanks. Hi...im going to open a barber shop in london and i need a nice namr for my shop please help thanks ..